Located in Puerto de la Cruz, Maritim Hotel Tenerife is by the sea and convenient to Loro Park and Garden Beach. This 4-star hotel is within close proximity of San Felipe Castle and Puerto de la Cruz Archaeological Museum. Make yourself at home in one of the 170 air-conditioned rooms featuring minibars. Rooms have private balconies. Satellite television is provided for your entertainment. Private bathrooms with shower/tub combinations feature complimentary toiletries and bidets. Dip into one of the 3 outdoor swimming pools or enjoy other recreational amenities including outdoor tennis courts and a sauna. This hotel also features complimentary wireless Internet access, babysitting/childcare (surcharge), and an arcade/game room. If you'd like to spend the day shopping, you can hop on the complimentary shuttle. Grab a bite at one of the hotel's 2 restaurants, or stay in and take advantage of room service (during limited hours). Relax with a refreshing drink at one of the 2 poolside bars. A complimentary buffet breakfast is served daily. Featured amenities include a business center, express check-out, and complimentary newspapers in the lobby. Planning an event in Puerto de la Cruz? This hotel has 15301 square feet (1421 square meters) of space consisting of a conference center and a meeting room. Guests may use a roundtrip airport shuttle for a surcharge, and self parking (subject to charges) is available onsite. 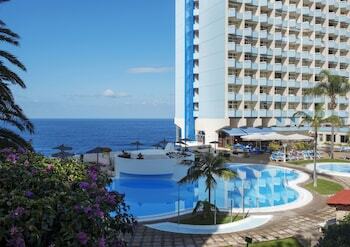 Maritim Hotel Tenerife is an amazing Puerto de la Cruz lodging choice for your trip to Spain. With numerous amenities for guests such as 24 hour front desk, fitness center, gift shop, you will wake up at Maritim Hotel Tenerife feeling invigorated every day for your time in Puerto de la Cruz. Don’t let this amazing reservation opportunity pass you by, book your stay at Maritim Hotel Tenerife today to make the most of your time in Puerto de la Cruz, Spain.